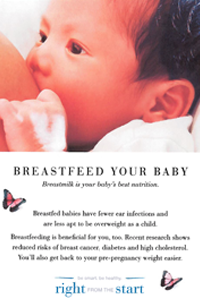 Breastfeeding | Broward Healthy Start Coalition, Inc.
Breastmilk is the perfect food for infants and the only food they need for about the first six months of life. It is free yet provides long lasting health benefits to both the mother and baby. The physical nature of breastfeeding provides the mother and baby with a joyful bonding experience. Though natural, breastfeeding is a learned skill that requires patience and practice. For some women, the learning stages can be frustrating and uncomfortable and for others, it is easy. Some situations make breastfeeding even harder, such as babies born prematurely or health problems in the mother or baby. The good news is that it does get easier, and support for breastfeeding mothers is growing. If you live in Broward County and are breastfeeding and need help, ask for it. Don’t wait. There are many resources available including the WIC office, Healthy Start services, and private lactation consultants and lactation specialists. There is also a local, printable Breastfeeding Resource Guide for your reference. If you are pregnant and planning to breastfeed, it is recommended that you attend at least one prenatal breastfeeding class before delivery. Talk to your prenatal health care provider about your desire to breastfeed and ask how they can support your decision. And be sure to choose a pediatrician that supports breastfeeding. If you are unsure who to call for assistance with your breastfeeding concerns, call the local Florida Department of Health Broward County WIC Program WARMLINE at (954) 467-4511.
http://www.womenshealth.gov/breastfeeding/index.html – for tips and suggestions on how you can successfully breastfeed. http://www.llli.org/web/florida.html – to obtain breastfeeding help, locate La Leche League support groups and obtain tips and information sheets to help you meet your personal breastfeeding goals.